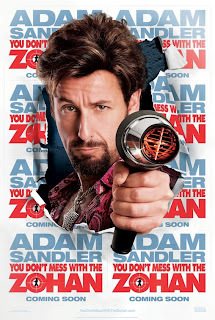 We went to see You Don't Mess With the Zohan this morning. Adam Sandler is a strange, strange man. Did someone put a gun to your head? Unbelievably, it was my idea. Although I heard the Panda movie is OK, entertainment-wise. The Mad Cow has eaten my brain. "The Mad Cow has eaten my brain. The only actor I find more annoying than Adam Sandler is Mike Myers. Or maybe Rob Schneider. That was a bad era for SNL. Actually, I have to admit that there were a couple places in that movie where I did laugh out load. Heh. You said "laugh out load"